Tuberculosis control relies on the identification and preventive treatment of individuals who are latently infected with Mycobacterium tuberculosis. However, direct identification of latent tuberculosis infection is not possible. The diagnostic tests used to identify individuals latently infected with M. tuberculosis, the in vivo tuberculin skin test and the ex vivo interferon-γ release assays (IGRAs), are designed to identify an adaptive immune response against, but not necessarily a latent infection with, M. tuberculosis. The proportion of individuals who truly remain infected with M. tuberculosis after tuberculin skin test or IGRA conversion is unknown. It is also uncertain how long adaptive immune responses towards mycobacterial antigens persist in the absence of live mycobacteria. Clinical management and public healthcare policies for preventive chemotherapy against tuberculosis could be improved, if we were to gain a better understanding on M. tuberculosis latency and reactivation. This statement by the TBNET summarises knowledge and limitations of the currently available tests used in adults and children for the diagnosis of latent tuberculosis infection. In summary, the main issue regarding testing is to restrict it to those who are known to be at higher risk of developing tuberculosis and who are willing to accept preventive chemotherapy. The World Health Organization once estimated that approximately one third of the world’s population had been infected with Mycobacterium tuberculosis, but the most recent report refrains from providing such an estimate 1. It is well established that only a minority of those individuals who are thought to have become infected with M. tuberculosis will ever develop tuberculosis. In 1930, Andvord 2 recognised that the epidemiology of tuberculosis in children predicts the subsequent epidemiology when they have become adults 3. One hypothesis to explain this observation is latent infection with M. tuberculosis that leads to reactivation years after acquisition of the primary infection. However, this hypothesis is somewhat at odds with the observation made by Canetti 4, who reported in 1939 that the majority of primary lesions become sterile over the years, and most episodes of recurrent tuberculosis were in fact due to reinfection. An alternative hypothesis is, therefore, that a primary infection primes the immune system in such a way that it responds differently and, frequently, more violently, with a tissue-destroying hypersensitivity reaction as described by Koch whose name the phenomenon continues to bear 5. That both pathways are relevant is now undisputed, but the extent to which each applies in a given situation remains elusive. The lesson that might nevertheless be learnt from the work of our predecessors is that a positive result of currently available immune-based diagnostic tests is primarily a measure of an immunological response to stimulation by mycobacterial antigens that cannot necessarily be equated with the presence of live M. tuberculosis in the human host. Nevertheless, persistence of M. tuberculosis leading, after an undefined incubation period, to clinically manifest tuberculosis is an undisputed reality 6. To explain this phenomenon, it is postulated that there is a persisting subclinical or latent infection with such a small number of bacilli that is insufficient to produce clinically manifest disease, unless some changes in immunological response allow these bacilli to metabolise and multiply at a higher rate, reaching such numbers that overt clinical disease ensues 7. The undefined incubation period resulting from latency has great repercussions on the approach to tuberculosis interventions. At the most generic level, a “tuberculosis control strategy” might be defined as aiming at a reduction in the incidence of infection with M. tuberculosis through case finding and curative treatment of transmitters of tubercle bacilli, to create generations with less and less infection as a result of transmission. Embarking on a “tuberculosis elimination strategy” and eventual eradication will require, in addition, a reduction of the prevalence of infection with M. tuberculosis through identification and successful treatment of those individuals already latently infected with viable M. tuberculosis, who may develop reactivation tuberculosis at some future point. The biological nature of a persistent infection with M. tuberculosis that may or may not cause tuberculosis is discussed controversially 8. There are two principal approaches to tests that are used in clinical practice to identify individuals with latent infection with M. tuberculosis, often abbreviated as “LTBI” (the term “latent infection with M. tuberculosis” will be used henceforth to describe individuals who are thought to harbour live M. tuberculosis not revealing themselves through any clinical or other sign or symptom of active disease; where M. tuberculosis causes clinically manifest illness, the traditional term “tuberculosis” without further qualifications will be used to designate the disease). These are the in vivo tuberculin skin test, which uses a mixture of antigens obtained as a protein precipitate from the supernatant of liquid cultures of M. tuberculosis, and the ex vivo interferon-γ release assays (IGRAs), which are designed to identify a memory of an adaptive immune response against mycobacterial antigens 9. It is currently not possible to identify the presence of living bacilli in persons thought to have latent infection with M. tuberculosis. The sensitivity of the tuberculin skin test, which is still the most widely used for the identification of individuals with latent infection with M. tuberculosis, is compromised in individuals with immunosuppression due to disease or treatment. There is evidence suggesting that the sensitivity of IGRAs is higher than that of skin testing 10–14, although large head-to-head studies in immunocompromised patients are lacking. Furthermore, tuberculin skin test sensitivity depends on the chosen cut-off point and is, thus, co-dependent on the chosen level of test specificity. In contrast to IGRAs, test specificity of the tuberculin skin test is importantly determined by the extent to which antigens from environmental mycobacteria that commonly infect humans cross-react with tuberculin. The closest antigenic relationship between species is found within the M. tuberculosis complex, and cross-reactions and, therefore, reduced specificity is of particular practical relevance following vaccination with bacille Calmette-Guérin (BCG), an attenuated strain of M. bovis. BCG vaccination leaves an immunological imprint for a prolonged period of time subsequent to its presumed complete elimination from the human body 15–17, which is precisely the intention of vaccination. The proportion of individuals with a persistently positive immune response against M. tuberculosis diagnosed by a tuberculin skin test or IGRA, who have not received chemotherapy to reduce the risk of developing tuberculosis and who have latent infection with M. tuberculosis, is not known. Clinical management and public health policies for the identification and treatment of individuals thought to be latently infected with M. tuberculosis could be improved if a better understanding on the nature of latent infection with M. tuberculosis was gained. The present statement by the TBNET consensus group on latent infection with M. tuberculosis summarises the current knowledge of the immunopathogenesis of M. tuberculosis latency in humans, the mechanisms and the predictive values of the tests that aim to identify individuals with latent infection with M. tuberculosis, and the current rationale for tuberculosis contact tracing in adults and children. Levels of evidence are assigned to management recommendations in the sections 4 and 5, where appropriate (table 1⇓). Evidence levels are indicated in parentheses after the relevant statement. M. tuberculosis is inhaled within aerosols of droplet nuclei and reaches distant segments of the bronchoalveolar tree, predominantly in the lower lobes of the lungs. M. tuberculosis is phagocytosed by alveolar macrophages which in their quiescent state mount little resistance, both in terms of antimicrobial effector functions and in terms of pro-inflammatory responses. Neutrophils accumulate early at the site of infection, but are incapable of killing M. tuberculosis directly. Dying neutrophils and macrophages shed blebs containing M. tuberculosis antigens or spill intact M. tuberculosis; both can be taken up by alveolar dendritic cells which migrate to the regional lymph nodes, where they present M. tuberculosis antigens to major histocompatibility complex (MHC) class-I restricted CD8 T-cells and MHC class-II restricted CD4 T-cells. In the lymph node, stimulated CD4 and CD8 T-cells differentiate into interferon (IFN)-γ secreting T-helper (Th) type 1 or cytotoxic Tc1 cells, respectively, and granules of CD8 T-cells accumulate molecules such as granzymes and granulysin 18. At the same time, B-cells differentiate into M. tuberculosis-specific antibody-secreting cells. More recently, Th17 cells, secreting interleukin (IL)-17, IL-21 and IL-22, and regulatory T-cells, secreting IL-10 and transforming growth factor-β, have been implicated in coordinating and balancing these primordial driving forces of the cellular immune response 19, 20. These M. tuberculosis-specific effector cells enter the blood circulation and get access to sites of inflammation, such as the lung (fig. 1⇓). At this stage, a delayed-type hypersensitivity (DTH) response in the skin or in blood may become positive upon tuberculin skin testing and intragranulomatous necrosis may ensue. The combination of a primary granulomatous lesion in the lung and the dependent enlarged hilar lymph node is known as “Ghon complex”. Summary of the dynamic sequence of events governing the generation, persistence and reactivation of granulomatous lesions in the course of Mycobacterium tuberculosis infection. For details of T-helper cell priming, triggering and effector molecules, and sequential progress of lesions to latency and reactivation, please refer to section 1 of the present article. IFN: interferon; IL: interleukin; TNF: tumour necrosis factor; ESAT: early secreted antigenic target; CFP: culture filtrate protein; ROI: reactive oxygen intermediates. It is conceivable that during the initial growth phase within alveoli, M. tuberculosis may also spread bronchogenically to other parts of the lung. Following transportation to the regional lymph node, haematogenous dissemination of M. tuberculosis is thought to be the rule. Whichever body part they reach, the micro-organisms may gain entry to epithelial cells, fibroblasts or even adipocytes 21, 22, or become engulfed by local tissue macrophages. This usually elicits a low-grade inflammatory response which attracts antigen-responding T- and B-cells (granulomas; fig. 1⇑). Scars of tuberculosis are most commonly found on autopsy in the lung apices. Post-primary reactivation disease often starts its apicocaudal propagation through the lung tissue from the apices. The presence of activated Th1 cells at the site of M. tuberculosis implantation alters the infiltrate in a striking fashion: mononuclear cells are attracted and organised in a highly specific way to form the granuloma, in which mycobacteria-containing macrophages that morphologically differentiate into “epithelioid” cells are surrounded by lymphocytes 23. This juxtaposition affords effective activation of macrophages, mostly via IFN-γ, and antimycobacterial effector molecules. These include reactive oxygen and nitrogen species that are delivered to the fusing phagolysosome. The host Tc1 cells deliver granulysin and other mycobactericidal molecules in a perforin-dependent fashion to the macrophage. This T-cell response leads to a reduction of mycobacterial growth and even, to a certain extent, to the killing of M. tuberculosis (fig. 1⇑) although this is difficult to demonstrate in vitro using, for example, human macrophages. The evidence that B-cells and M. tuberculosis-specific antibodies can mediate protection against extracellular M. tuberculosis is highly controversial as their contribution is probably of minor importance. Depending on the number of mycobacteria present in the lesion and the level of cellular immune responses generated, the antibacterial protective response can also lead to the destruction of macrophages, resulting in necrosis of the central areas of the granuloma. A concomitant, overwhelming Th2 response with IL-4/IL-13 secreting T-cells may also counteract the mycobactericidal mechanisms in macrophages and may contribute to central granuloma caseation (fig. 1⇑) 24. This solid necrotic mass is thought to be devoid of oxygen and may, over time, become sclerotic and even calcified, commonly resulting in containment or death of M. tuberculosis 4. 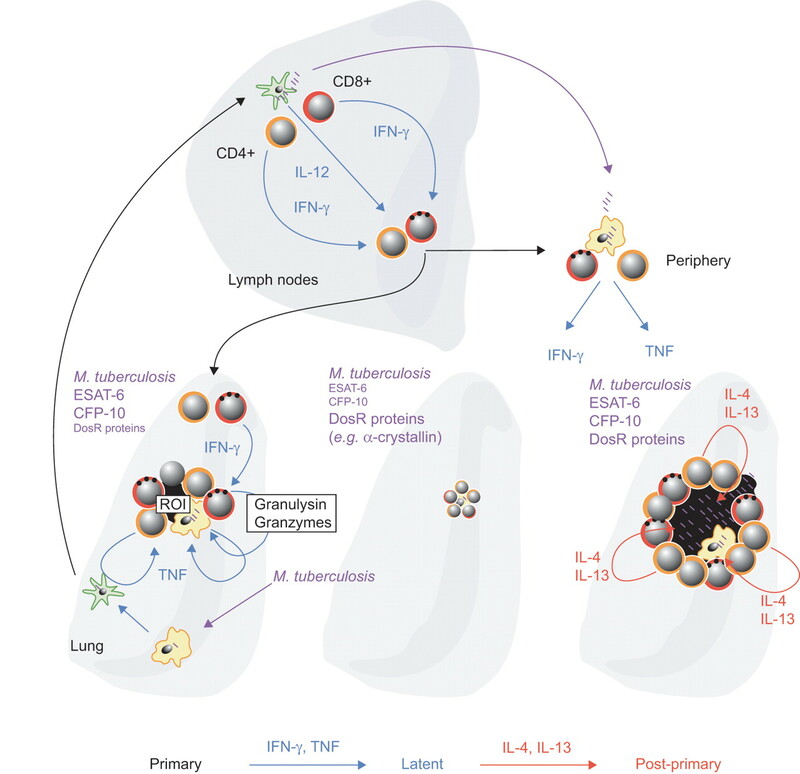 In summary, well-organised granulomas are entirely dependent on an effector Th1 response and mediate restriction of M. tuberculosis growth either within IFN-γ-activated macrophages or within the adverse conditions of the necrotic caseum. In contrast, if no or only low-level T-cell immunity is generated under conditions of T-cell deficiencies, M. tuberculosis growth is not contained. Nevertheless, this is associated with comparatively little tissue damage. Granulomas are dynamic lesions with cells continuously dying, debris being removed, and new cells entering. When cells are prevented from entering (e.g. by blocking the expression of adhesion molecules or inflammatory chemokine cascades by the administration of tumour necrosis factor (TNF)-α targeting drugs), the granulomatous structure disintegrates leading to the dissemination of its content. Within a granuloma, it is assumed that there is equilibrium of actively dividing M. tuberculosis and M. tuberculosis adapted to the stress generated within activated or foamy macrophages that do not completely destroy M. tuberculosis but prevent their growth (fig. 1⇑). Thus, M. tuberculosis is thought to enter a state of nonreplicating persistence within the necrotic part of the lesion 25. Although the exact nature of the metabolic state of M. tuberculosis during this stage awaits detailed characterisation, genes involved in fatty acid hydrolysis for energy generation are highly upregulated 26, 27. Because there is no clinically apparent disease activity, this stage of the infection has been termed “latent”, as opposed to manifest. Mycobacteria are kept at bay, but remain present and viable, poised for “resuscitation”, i.e. uncontrolled replication in conditions of impaired cellular immunity. The true extent of long-term viability of M. tuberculosis within and even outside granulomas has been a matter of debate for decades. While earlier studies found viable M. tuberculosis in the majority of fibrocaseous lesions in the upper areas of the lung, other studies demonstrated that up to 50% of necrotic lesions and 85% of calcified lesions were sterile 28. It is likely that small foci of resuscitation occur from time to time, resulting in long-term persistence of M. tuberculosis progeny, but it is also possible that individual mycobacteria may remain in a truly quiescent state over decades. It is not clear which antigens are expressed and secreted during the stage of stress-adapted metabolism in granulomatous lesions or extracellularly, and how these antigens are processed for T-cell recognition 29; ESAT-6 and CFP-10, antigens secreted during active replication, are likely to play a much less dominant role than proteins from the DosR operon which is highly upregulated in latency (fig. 1⇑). Given that all anti-tuberculosis drugs are metabolic blockers, and specifically that isoniazid is effective only against multiplying M. tuberculosis and that isoniazid treatment of latent infection with M. tuberculosis is effective in 60–90% of cases, latent infection with M. tuberculosis must to some extent be accompanied by some replication of M. tuberculosis 28. The larger the viable mycobacterial load and the remaining lesions are, the more likely constant antigen-specific re-stimulation of the memory/effector T-cell pool becomes. Conversely, the more encapsulated and quiescent the lesions and the smaller in size they are, the more likely it is that Th1 cell immunity will decline 18. Indeed, a reversion from a positive to a negative tuberculin skin test can occur at a rate of 5%·yr−1 and there is evidence that IGRA positivity also wanes, and perhaps even more quickly, over time 30, 31. T-cell immunity will fade or become impaired for various reasons, particularly in acquired or drug-induced immunodeficiency. This may lead to recrudescence of mycobacterial growth, which is often localised in, and often seemingly limited to, the upper lobes where oxygen supply is thought to favour replication and to where M. tuberculosis has earlier been lodged after haematogenous dissemination. Consequently, T-cells encounter an increased antigenic load that precipitates a hyperinflammatory immune response with necrotic and cavitating lesions. Overall, however, reactivation disease is a rare event in immunocompetent individuals 32–35. Animal models do not reflect the full extent of the immunopathology of tuberculosis in humans. Therefore, it is difficult to extrapolate experimental findings derived from murine models to the clinical situation in humans 23. In both humans and animals, however, the protection afforded by a primary infection is limited and does not offer effective protection against super-infection with M. tuberculosis. Reinfection successfully causing a new disease episode is recognised to occur even in the absence of immunocompromising conditions. Thus, although vaccination with BCG or primary infection with M. tuberculosis mediates an accelerated containment of M. tuberculosis infection, resulting in risk reduction of dissemination (e.g. to the brain), it does not fully protect against pulmonary tissue-damaging disease. 1) IFN-γ-secreting T-cells are critical for granuloma formation and maintenance, ensuring persistent macrophage activation for mycobacteriostasis. 2) The number of T-cells secreting IFN-γ in response to M. tuberculosis antigens provides a quantitative measurement of specific T-cell immunity that is not correlated with protection from disease. 3) Latency is a state of persistent mycobacteria-specific T-cell responses, in the absence of clinical evidence for tuberculosis. 4) Controversy exists over the physical and metabolic nature and the location of persistent M. tuberculosis organisms or components thereof. 5) The T-cell response to antigens associated with the dormant state of M. tuberculosis may predominate during latency. 6) Reactivation of tuberculosis occurs when dormant, but live mycobacteria resume replication, boosting a detrimental T-cell response. Mechanisms of readout measures of an adaptive M. tuberculosis-specific immune response: how do the tuberculin skin test and IGRAs function, and what do they measure? The number of viable bacilli that comprise latent infection with M. tuberculosis is unknown but believed to be low and much remains to be learnt about their anatomical and cellular location. It is not currently possible to directly identify tubercle bacilli from persons latently infected with M. tuberculosis who do not have tuberculosis. However, since latent infection induces a strong Th1-type cellular immune response, its measurement can serve as a sensitive marker for the presence of small numbers of dormant bacilli. However, it is uncertain how specific it is in reflecting infection with viable but dormant mycobacteria. Currently, two immune-based test principles for the diagnosis of infection with M. tuberculosis exist, the “in vivo” tuberculin skin test and the “ex vivo” IGRA, the characteristics of which are summarised in table 2⇓ 9, 14, 38–40. At present, none of the available tests is able to reliably distinguish latent infection with M. tuberculosis from active tuberculosis or past tuberculosis. The tuberculin skin test is one of the few tests that have been continuously in use for about 100 yrs in clinical medicine 41. It attempts to measure cell-mediated immunity in the form of a DTH response to the most commonly used purified protein derivative (PPD) of tuberculin. Tuberculin PPD is a crude mixture of antigens, many of which are shared by M. tuberculosis, M. bovis, M. bovis BCG and several species of environmental mycobacteria. As a result, the tuberculin skin test has a lower specificity in populations with a high prevalence of BCG vaccination and infection with environmental mycobacteria. Tuberculin skin test reactions in humans are measured by the diameter of induration, measured 48–72 h after antigen injection. Clinically, the tuberculin skin test reaction may already start a few hours after the injection of tuberculin PPD with a white or rose-coloured induration of the skin as a type-I or type-III immune reaction followed by the DTH reaction, which peaks after 48–72 h and may last for up to 1 month, depending on the quality and quantity of the initial reaction. Strong reactions may result in tissue necrosis. A positive tuberculin skin test reaction may lead to persistent discoloration of the skin. From a histological point of view, the classical model of cellular infiltration during a DTH response suggests that cellular migration is biphasic, comprising an initial nonspecific infiltration that also occurs in nonsensitised subjects and a second specific peak 42–44. At very early time points (after 4–6 h) the majority of infiltrating cells are neutrophils 45. Approximately 12 h after challenge, T-cells begin to appear around dermal blood vessels 44. Maximal numbers of infiltrating activated macrophages are present at 24 h and, by 48 h, the majority of infiltrating cells are T-cells that accumulate perivascularly 46, 47; however, some T-cells diffuse into the epidermis and the interstitium. CD4 T-cells always exceed the number of CD8 T-cells 48, 49. The mechanism of this cellular infiltration is not entirely clear but it appears that very early after the injection, pro-inflammatory cytokines, such as IFN-γ, TNF-α and TNF-β stimulate expression of adhesion molecules on the endothelium (E-selectin) and increase permeability of the local blood vessels. Frequencies of circulating CD4+CD25+FoxP3+ “regulatory” T-cells influence the size of the induration of the tuberculin skin test 50. Cutaneous CD4 T-cells accumulating after tuberculin PPD stimulation in the skin are predominantly of a CD45 RO memory phenotype 50. IGRAs have been developed and are now licensed for clinical use in many countries 9, 15, 51, 52. Both available tests measure in vitro IFN-γ production by circulating T-cells after 16–20 h stimulation in response to specific M. tuberculosis antigens. The genes encoding these antigens are found in the region of difference (RD), either RD1 (CFP-10 and ESAT-6) or RD11 (TB7.7) of the M. tuberculosis genome, which are deleted from the genome of M. bovis BCG and not present in most environmental mycobacteria, including the M. avium complex 53, 54. As a particular advantage of in vitro testing, stimulation reactions with negative control and positive control (mitogen stimulus) are carried out in parallel to primarily evaluate test performance with respect to background signals or general T-cell responsiveness. In the setting of immunodeficiency, an impaired mitogen response may, in addition, be interpreted as a meaningful measure for the assessment of the overall extent of immunosuppression. Therefore, unlike skin testing, in vitro tests may be able to discriminate true negative responses from anergy. IGRAs are based on the principle that T-cells of individuals sensitised by M. tuberculosis produce IFN-γ when they re-encounter mycobacterial antigens. Specific IFN-γ production in response to mycobacterial antigens, therefore, is presumed to be indicative of infection with M. tuberculosis 9, 55 and can be measured by the rapid ex vivo enzyme-linked immunospot (ELISPOT) assay 9, 55 or by the whole blood ELISA 9. It has been shown by flow cytometry that the T-cells responding to the RD antigens after 24-h stimulation are predominantly CD4 T-cells of an effector memory phenotype, characterised as being CD45RA-CCR7-, consistent with having recently encountered antigen in vivo 11, 12, 36, 37. In contrast, long-lived central memory T-cells that may persist even after successful treatment of tuberculosis 11, 12, 36, 37, 56, 57 are less likely to release IFN-γ after <24 h of incubation and more likely to produce IL-2 56. Neither of the two IGRAs, when used on blood alone, can currently distinguish tuberculosis from latent infection with M. tuberculosis. Consequently, novel concepts have been investigated that include the use of different epitopes of RD antigens 11, 12, 36, 37, 58, readout different from IFN-γ such as chemokines or cytokines 56, 58, new antigens different from the RD genomic region, such as those defined as Rv1733c, Rv2029c, Rv2032, Rv2626c, Rv2627c, Rv2628 and HspX 29, 59–61, additional cytokines 56 or characteristic phenotypic markers 11, 12, 36, 62. Diagnostic sensitivity of IGRA can also be enhanced by incorporation of a novel RD1-encoded antigen, Rv3879c, without compromising diagnostic specificity 63. Moreover, as active tuberculosis involves recruitment of antigen-specific T-cells to the site of the active infection, the comparative analysis of antigen-specific cells from the blood and the site of disease (e.g. bronchoalveolar lavage, pleural effusion and cerebrospinal fluid effusion) may help to distinguish tuberculosis from latent infection with M. tuberculosis 64–69. 1) Tuberculin skin test measures cell-mediated immunity in the form of a DTH response to the most commonly used tuberculin PPD within 48–72 h. The tuberculin skin test involves infiltration of neutrophils, CD4 T-cells and CD8 T-cells; the cells need to home and migrate out of capillaries into the skin. The response is mediated by several cytokines (i.e. IFN-γ, TNF-α and TNF-β). 2) Sensitivity of the tuberculin skin test is limited in immunocompromised individuals and specificity is limited because of cross reactivity due to prior infection with environmental mycobacteria or BCG vaccination. 3) IGRAs measure in vitro IFN-γ production by circulating T-cells after 16–24 h in response to specific M. tuberculosis antigens. IGRAs have a higher specificity in populations with a high prevalence of BCG vaccination compared with tuberculin skin test. 4) Tuberculin skin tests and IGRAs cannot discriminate active from latent infection. Screening for latent infection with M. tuberculosis aims to identify individuals at risk of developing tuberculosis. The present section discusses the presumed limitations of the commonly used tuberculin skin test and IGRA. In immunocompetent hosts it is estimated that ∼50% of cases of tuberculosis will occur within the initial 2 yrs after initial infection and tuberculin skin test conversion 70. However, the time of tuberculin skin test conversion is only known in selected groups. Furthermore, tuberculin skin test results may be positive because of prior BCG vaccination or infection with environmental mycobacteria. Unfortunately, BCG vaccination does not always leave an identifiable scar and, furthermore, BCG vaccination mediates only partial protection against development of tuberculosis. Until recently, it has been exceedingly difficult, if not impossible, to identify latent infection with M. tuberculosis among BCG-vaccinated subjects and to exclude them from being at risk of tuberculosis. Past mycobacterial infections can result in persistently positive tuberculin skin test results. The use of different cut-off values, as indicated in various national guidelines, or depending on the risk of infection and BCG status further complicates the interpretation of tuberculin skin test results 71. In immunocompromised hosts, all available data should be used to demonstrate or exclude latent infection with M. tuberculosis. The risk of developing active tuberculosis is different between various immunocompromising conditions. However, screening for latent infection with M. tuberculosis in immunocompromised patients is carried out irrespective of the type of immunosuppression, because the risk of developing active tuberculosis is probably higher compared with that of immunocompetent individuals. Careful history taking and physical examination in combination with chest radiography and tuberculin skin testing have been the cornerstones for detection of latent infection with M. tuberculosis. This approach has resulted in a decrease in the number of cases of tuberculosis in patients treated with certain medications, such as anti-TNF-α targeting drugs 72. However, the tuberculin skin test has a reduced sensitivity in subjects who are already using immunosuppressive drugs 12 or in those suffering from chronic illnesses such as rheumatoid arthritis 73–75, chronic renal insufficiency 11, 13, 76 or HIV infection 77–81. Reduced sensitivity in patients on immunosuppressive drug therapy may be a direct result of inhibitory drug action (e.g. corticosteroids, calcineurin inhibitors and methotrexate) on cytokine signalling, antigen-presenting cells or T-cell proliferation 82, 83. Moreover, immunosuppressive drugs may favour pathogen reactivation and progressive consumption of antigen-specific T-cells over time. In patients with renal insufficiency, skin testing may be adversely affected by an altered expression of costimulatory molecules on antigen presenting cells 84. Finally, in HIV infected patients, low numbers of circulating CD4 T-cells and high frequencies of circulating regulatory T-cells directly correlate with skin test anergy 50. While it is reasonable to assume that these factors may also adversely affect in vitro testing, accumulating evidence suggests that IGRAs are of superior sensitivity compared with skin testing as experimental conditions in vitro may be optimised with respect to incubation time and/or adjustment of cell numbers. In the setting of tuberculosis, studies are hindered by the lack of a gold standard for establishing absence or presence of latent infection with M. tuberculosis. In order to estimate the specificity and sensitivity of the test formats, the type and extent of immunodeficiency has to be taken into account and surrogate conditions such as tuberculosis or patients with defined risk of exposure are needed. With the early acceptance of IGRAs as a tool to detect latent infection with M. tuberculosis 85 it became impossible to conduct adequate research into their predictive value for the development of tuberculosis. It is considered to be ethically unacceptable to disregard a positive IGRA test result as general consensus dictates that treatment of latent infection with M. tuberculosis should be considered. However, the predictive role of IGRAs in detecting latent infection with M. tuberculosis in immunosuppressed individuals has not been investigated in detail thus far. Retrieval of data on these patients will, however, not be easy and is dependent on an adequate national or regional tuberculosis registry. The ability of IGRA to predict development of tuberculosis remains an elusive goal. In an ideal setting, large cohorts of subjects with both known tuberculin skin test and IGRA results should be followed for the development of tuberculosis. Preferably this follow-up should be done in a setting with a low risk of reinfection during follow-up. To allow the study of both the positive and negative predictive value of IGRA, a sufficient proportion of subjects with positive or negative results should have deferral of treatment of latent infection with M. tuberculosis. Recently, a large study described the rate of progression to tuberculosis within 2 yrs of contact screening in subjects being close contacts (defined as >40 h of cumulative contact time) of patients with pulmonary tuberculosis 86. In this study the total number of positive ELISA-based IGRA results was four-fold lower compared with the tuberculin skin test (using a cut-off of 5 mm or more to denote test positivity). Of 41 IGRA positive individuals who refused preventive chemotherapy, six developed active pulmonary tuberculosis. Because of the lower number of initial positive results for the IGRA, its positive predictive value for development of tuberculosis was significantly better than that of the tuberculin skin test. Among those diagnosed as having tuberculosis, M. tuberculosis could not be isolated from sputum culture in four out of six cases, a definite study limitation. None of the subjects reported immunocompromising conditions. Thus, it has to be established whether the positive and negative predictive values in immunocompromised patients will be the same as those in immunocompetent individuals. In general, a considerable proportion of indeterminate IGRA results due to impaired mitogen reactivity could be a problem when analysing immunocompromised subjects 87. A single large prospective study has been published describing the risk of progression to tuberculosis after conversion to a positive ELISPOT assay in Gambian case contacts 88. In this study, ELISPOT positive contacts had a similar rate of progression to those who were skin test positive, whereas those negative on either or both tests had the lowest rate of progression. Since initial ELISPOT test and skin tests were positive in only about half of cases, whereas 71% were positive by one or the other test, positivity by either skin testing or IGRA was suggested as the best indication for preventive treatment. As more such studies, especially in low prevalence countries, are lacking, the use of surrogate studies is required. A review article has described a sensitivity for tuberculosis of 88%, 76% and 70% for ELISPOT, ELISA and tuberculin skin test, respectively 15. The sensitivity of the tuberculin skin test could be improved to 73% and 80% after lowering the cut-off values to 10 and 5 mm, respectively, yet at the cost of compromised specificity. In a number of contact investigations, substantially fewer BCG unvaccinated subjects had positive IGRA results compared with positive tuberculin skin test results 74, 86, 89–99. Comparability between the two IGRAs was generally good, whereas the agreement between tuberculin skin test and IGRA was poor, owing to false-positive tuberculin skin test results in BCG-vaccinated subjects or, based on studies among BCG unvaccinated subjects, to lower sensitivity of IGRA for detection of infections acquired in the past. ELISPOT test results were, in general, more often positive compared with ELISA assays, which may result from differences in sensitivity and/or specificity. Thus, future studies will have to establish the implications for the clinical use of these tests in both immunocompetent and immunocompromised patients. In contacts from an outbreak at a supermarket 89, conversion to positive tuberculin skin test results 1 yr after exposure has been demonstrated in a small subgroup of patients with an initially negative tuberculin skin test in association with a positive IGRA result 100. As the tuberculin skin test has been an adequate, albeit nonspecific, tool for the detection of infected persons at risk of tuberculosis reactivation, and that low sensitivity has not been a problem in immunocompetent individuals, it is highly unlikely that those late tuberculin skin test converters would have an increased risk of progression to tuberculosis. During follow-up of the population screened after exposure at the supermarket 89, only one patient developed pulmonary tuberculosis. This patient initially had both positive tuberculin skin test and IGRA (both ELISPOT and ELISA) results (unpublished data). Depending on the selection of the cut-off value for the tuberculin skin test the sensitivity and specificity for detection of latent infection with M. tuberculosis infection will differ. Thus, for cut-off values as low as 5 mm, individuals with positive tuberculin skin test results will reflect a mix of subjects with latent infection with M. tuberculosis, environmental mycobacteria infection or BCG vaccination. The proportion of subjects with true latent infection with M. tuberculosis results will increase with increasing cut-off values to designate a positive tuberculin skin test result. In immunocompromised hosts with similar risk profile the median indurations will be lower due to an altered ability to produce an adequate immune response, although this notion has been challenged in HIV-infected patients with sputum smear-positive pulmonary tuberculosis from high-prevalence countries 79. The clinical relevance or the predictive value of a positive tuberculin skin test (which patients will develop tuberculosis in the near future) is generally poor, while the negative predictive value (those subjects with a negative tuberculin skin test who will not develop tuberculosis in the future) is high. Several national guidelines (Centers for Disease Control and Prevention in the USA 101, National Institute for Health and Clinical Excellence (NICE) in the UK 102, and guidelines from Switzerland 103) suggest the use of IGRA in the screening for latent infection with M. tuberculosis and/or to confirm a positive tuberculin skin test. The positive predictive value for the development of tuberculosis will most likely be higher with an IGRA than with the tuberculin skin test because of the higher test specificity and similar, or probably higher, sensitivity. In immunocompetent individuals, the negative predictive value of IGRA for active tuberculosis is very high, if combined with a negative result of the tuberculin skin test 63, 104. In immunocompromised individuals the negative predictive value of IGRA needs to be established. The tuberculin skin test has been in use for more than a century. Despite its limitations, clinicians feel comfortable with this test format in immunocompetent hosts who are not vaccinated with BCG. Owing to the high negative predictive value in immunocompetent hosts, few patients will be incorrectly withheld adequate treatment. Using IGRAs, the number of patients treated for latent M. tuberculosis infection will most probably be reduced. Clinicians have to carefully weigh the benefit from not overtreating patients against the still unclear negative predictive value from IGRA. This problem will be overcome by the use of a two-step approach (tuberculin skin test and confirmation of positive tuberculin skin test results by IGRA). 1) Tuberculin skin test sensitivity and specificity is influenced by the cut-off used. A lower cut-off will result in a higher sensitivity and a lower specificity for M. tuberculosis infection. 2) Tuberculin skin test and IGRA results in general correlate poorly, mainly because of positive tuberculin skin test results in individuals vaccinated with BCG. ELISA and ELISPOT results, in general, have a better correlation. 3) In order to improve the specificity of test results, several national guidelines recommend initial tuberculin skin test screening and confirmation of a presumed infection with an IGRA. 4) The positive predictive value of IGRAs for the development of active tuberculosis is likely to be equal or better than that of the tuberculin skin test for immunocompetent individuals. The negative predictive value of IGRA for active tuberculosis is very high in immunocompetent hosts if combined with the tuberculin skin test. The risk of progression from latent infection with M. tuberculosis declines exponentially ∼10-fold over the first few years and subsequently stays at this level for perhaps decades. In the initial years following infection the cumulative risk is 2–5% or approximately one per 100 person-years 32, 33, with the subsequent risk of about one in 1,000 person-years accumulating to a lifetime risk of 10–15% 34, 35 if infection occurs at a relatively young age, including reactivation that may occur decades after infection 105. This baseline risk increases substantially to 5–15% annually in immunologically compromised patients (see also section 3) 106–108. Early detection using immunological tests will be affected by the cross-reactivity with antigens resulting from prior sensitisation by other mycobacteria including the BCG vaccine strain. Cross-reactivity can be substantial with the tuberculin skin test but it is much reduced with IGRAs. Nevertheless, to the extent driven by the variable test specificity, the predictive value of a positive test result is greatly increased in persons with a history of contact because a selection is made on a relatively large expected prevalence 109. The prevalence of infection with M. tuberculosis is strongly associated with duration of close contact 110–112 and the characteristics of the putative source of infection 113–115. Contacts exposed for a prolonged period (e.g. household contacts and other persons within a close-knit social network) to a case of sputum smear-positive disease are particularly at risk. Among these, children aged <5 yrs and immunocompromised patients have a particularly high risk of direct progression to severe forms of the disease, such as meningeal tuberculosis 116, 117. These groups should, therefore, be priorities for contact tracing 101, 117, 118. There are several difficulties associated with tuberculosis contact tracing that need to be borne in mind. First, the longer the period during which a case is able to transmit M. tuberculosis, particularly if sputum smear-positive, the more likely that transmission may reach considerably beyond the closest contacts 110. Brief and casual contacts are relatively frequent but entail a relatively small risk of becoming infected. In contrast, being exposed for a prolonged period of time (such as spouses sharing an indoor environment for many hours) is a rarer event but entails a large risk of becoming infected. With a prolonged period of undiagnosed infectiousness, the numbers of persons becoming infected through casual contact may indeed exceed the number of individuals who have become infected in a small household. Efforts to trace them are costly, have a low yield, and the resulting poor predictive value of any positive test result generally precludes extensive contact tracing before those at highest risk have been thoroughly evaluated. Therefore, in order to increase efficiency, inclusion criteria for screening need to be defined, with initial screening of close household contacts, those with prolonged exposure to a symptomatic, multi-bacillary source (where “prolonged” remains difficult to quantify), children and immunocompromised individuals. In deciding priorities for contact screening, the guiding considerations are that the risk of becoming infected depends on the quantity of bacilli expelled into the ambient air by a source case, the volume of air into which the bacilli are released, and the exposure time of a susceptible individual to that air. If infected contacts are found within this group, screening may then be extended to include more distant contacts 110. While such restrictions will reduce the sensitivity in identifying recently infected contacts, limiting contact tracing will increase the positive predictive value of testing through an increase in the expected prevalence of infection. Exposure to cases other than sputum smear-positive carries a much lower risk of infection 114. The UK NICE Guidelines 119, however, recommend screening of close contacts of all cases of active tuberculosis, the advantages, among others, being active detection of other tuberculosis cases, particularly children within a family group. Secondly, test specificity can be positively influenced by the choice of the cut-off point when using the tuberculin skin test as the diagnostic test, albeit by sacrificing sensitivity. The inverse is not necessarily always the case, at least not as available data on HIV infection seem to suggest 79. As only a minority of persons found to be “tuberculin skin test positive” are at any risk of tuberculosis, even rare adverse drug events must remain a serious consideration in prescription of preventive therapy. In countries where IGRAs are available, confirmation of a positive tuberculin skin test by an IGRA is recommended by some experts 119, as it probably allows a reduction in the number of contacts erroneously considered to be infected and, thus, of the number of persons for whom a preventive treatment is indicated 120. Others recommend that IGRAs completely replace the tuberculin skin test for identifying latent infection 85. Today, some data from prospective studies are now emerging that look at the risk of tuberculosis in those with a positive IGRA 86, 88, 121, 122. Thirdly, those identified eligible for treatment of latent infection with M. tuberculosis must be assured to complete a full course of preventive therapy for maximum efficacy. It has been shown that both inappropriate screening and failure to ensure completion of preventive therapy compromise its effectiveness 123. Adherence might be improved by the type of regimen employed and offering the patient a choice in its selection, provided that there are no medical contraindications for a particular choice 124. The individual's interest is best served by treatment regimens for latent infection with M. tuberculosis that have a low toxicity and promise high efficacy with the shortest possible duration of treatment (table 3⇓). This is more likely to encourage adherence and, thus, confer both public health and individual benefit. Recommendations of influential national bodies disagree, however, on appropriate preventive chemotherapy regimens, reflecting the uncertainty of the evidence. The largest clinical trial ever done with isoniazid clearly assigns 12 months to be most efficacious among “completer-compliers” (93%), and 6 months to be inferior (69%) 33, yet the American Thoracic Society recommends 9 months 127, and the British Thoracic Society 6 months 117. The difference in opinion is attributable to a difference in interpretation of whether the regimen choice should be based on efficacy 33 or on effectiveness 128. Rifampicin-containing regimens are shorter and have fewer adverse drug events but do not have an extensive trial record. The treatment recommended by the British Thoracic Society is 3 months of rifampicin plus isoniazid 117, based on a randomised clinical trial among patients with silicosis 126, while the American Thoracic Society recommends 4 months of rifampicin alone 129, a recommendation not based on such a trial, but expected to have a lower risk of adverse drug events, as toxicity using both isoniazid plus rifampicin is cumulative 130. The most important contraindication for preventive therapy is the presence of manifest tuberculosis requiring an adequate course of multidrug chemotherapy. Relative contraindications for isoniazid include acute hepatitis and, for rifampicin, treatment with protease inhibitors or non-nucleoside reverse transcriptase inhibitors. Increasing age is associated with a higher rate of drug-induced hepatitis 131 such that the risk/benefit ratio of isoniazid preventive therapy is no more clearly favourable beyond age 45 yrs among reactors with presumed long-standing infection 132. In contrast, for recently exposed contacts with a positive tuberculin skin test, the risk of tuberculosis appears to exceed the risk of isoniazid-induced toxic hepatitis at all ages. A pragmatic approach to contact tracing will first target contacts of the most potent sources of transmission (sputum smear positive for acid-fast bacilli) who had the longest exposure to them, and being at particularly high risk of progression to tuberculosis following infection (small children and the immunocompromised). Depending on the prevalence of infection found in this group, the circle of contacts might then be expanded. To prevent unnecessary treatment, a “positive” tuberculin skin test result might be confirmed with a more specific IGRA. To improve adherence, contacts eligible for preventive therapy might then be given the choice between a regimen using a well-established isoniazid-regimen of 9–12 months duration, a regimen of rifampicin alone for 4 months, or a regimen comprising of rifampicin plus isoniazid for 3 months, balancing the choice between evidence of efficacy, convenience, and likelihood of adverse drug events. 1) The primary objective of contact tracing is to provide preventive therapy to persons identified at risk of tuberculosis: “intention to test is intention to treat”. 2) Contacts potentially benefiting from preventive therapy should be identified hierarchically according to likelihood of having become infected by a putative source, i.e. according to source characteristics (estimated duration of infectiousness prior to identification and extent of aerosolisation of bacilli, i.e. bacteriological sputum results and respiratory manoeuvres producing droplets), source–contact interaction (duration of exposure) and presence of potentially aggravating risk factors (such as immunosuppressive disorders or therapies; evidence A). 3) In tuberculin skin testing, specificity is increased with larger cut-off points, albeit at the expense of decreased sensitivity and vice versa. Where the choice is for low cut-off points in favour of sensitivity, such test results might be confirmed by the more specific IGRA (evidence D). 4) In the selection process of a preventive therapy regimen, the strongest evidence is a choice between 12 months of isoniazid (evidence A) and 3 months of rifampicin plus isoniazid (evidence A). 5) Some guidelines recommend a shorter regimen such as 9 months of isoniazid (evidence C), or 4 months of rifampicin alone (evidence C). Both may provide similar efficacy albeit at reduced risk of adverse drug events. Special considerations apply with regard to contact tracing and management of latent infection with M. tuberculosis in children. As a public health intervention, a sensitive and specific diagnosis of latent infection with M. tuberculosis in children coupled with appropriate preventive chemotherapy will reduce the future burden of disease. If a source of infection emerges in a household, small children are at particularly high risk of becoming infected with M. tuberculosis because exposure time is frequently long. Subsequent to infection, the risk of progression to tuberculosis differs greatly with maturation. It is largest in the youngest children and drops to one of the lowest in life during primary school to increase again with onset of adolescence to reach a second peak among young adults 34. Radiographic manifestations of primary tuberculosis, such as hilar and/or mediastinal lymphadenopathy, in infants and young children aged <5 yrs was reported in the pre-chemotherapy era ≥50%. Such children also had a markedly higher risk of severe manifestations such as disseminated and meningeal tuberculosis 133. The main effect of BCG vaccination is the reduction in the risk of the most severe forms of tuberculosis in infants, such as disseminated and meningeal tuberculosis; it reduces the risk of pulmonary tuberculosis to a lesser extent, and may have a limited role in the prevention of acquisition of infection 134, 135. However, due to an increasingly favourable epidemiological situation and following risk/benefit analyses, BCG vaccination has been suspended for the indigenous child population in most affluent European countries. In a recent survey in 2005, EuroTB reported on the very heterogeneous BCG policies in all European Union and other European countries with a low tuberculosis incidence: in 12 countries BCG is still given at birth with four countries re-vaccinating once or at several points in time. Five countries vaccinate older children before school age and 10 countries only vaccinate selected groups at risk. If vaccinated at birth, BCG coverage was between 83% and 99.8%, and children originating from high-burden countries showed 60–90% BCG coverage 136. The diagnosis of latent infection with M. tuberculosis in children relies on history of exposure, positivity of the tuberculin skin test and exclusion of clinical symptoms and radiological findings consistent with tuberculosis. The diagnosis is difficult due to deficiencies in the specificity of the tuberculin skin test, which is compounded if there is prior BCG vaccination. In children vaccinated at birth, positive tuberculin skin test results may be observed for up to 10 yrs, depending on the vaccine strain and may last even longer in the case of re-vaccination or repeated tuberculin skin testing 137, 138. Conversely, high-risk groups, such as immunocompromised children, often have a false-negative skin test. Cut-off points for the interpretation of skin test results in children have been defined to facilitate decision making for when an intervention is required, integrating vaccination history, epidemiologic and other risk factors, in an attempt to balance errors resulting from incomplete sensitivity and lack of specificity 127. There are only few data available on the incidence of environmental mycobacterial infection or mycobacterioses in Europe, but the reported increase of the latter, especially since the discontinuation of BCG vaccination, suggests the potential for causing false-positive tuberculin skin test results 139–141. As with adults, IGRAs have been shown to better discriminate between M. tuberculosis and common environmental mycobacteria in children, and they are most notably not confounded by prior BCG vaccination 142. Moreover, IGRAs show a better correlation with the extent of tuberculosis exposure than the tuberculin skin test 9, 135. Data on the performance of IGRAs in very young and immunocompromised children are still scarce but, unlike the tuberculin skin test, diagnostic sensitivity of ELISPOT in active tuberculosis appears to be independent of HIV co-infection and malnutrition 143. Thus, tuberculin skin test and IGRA results have to be interpreted with caution and the individual risk factors and clinical signs have to be taken into account. There are few data on the predictive value of IGRAs for the development of tuberculosis and recommendations for their use in children remain highly heterogeneous. According to a recent prospective cohort study from Turkey, the risk of progression to tuberculosis in household contact children with a positive ELISPOT result was 3–4-fold increased compared with children with negative ELISPOT results 144, which was, however, not significantly superior to the tuberculin skin test in predicting the progression to tuberculosis in these children. Guidelines in the UK 102, 119 and Germany 118, 145 recommend IGRAs as confirmatory tests following a positive tuberculin skin test in adults and children, whereas current French 146 and Canadian 147 guidelines refrain from recommending their use in children. This simple questionnaire gave a negative predictive value of >99.8% 148. Children with any of these risk factors should be further screened for evidence of latent infection with M. tuberculosis and exclusion of tuberculosis. At present, tuberculin skin test should perhaps best remain the basic diagnostic screening tool for latent infection with M. tuberculosis in children. Taking into account existing paediatric data, an IGRA should be considered if the following conditions are met. First, in children with a high risk of infection (especially young children aged <5 yrs and immunocompromised children) an IGRA should be performed in addition to the tuberculin skin test to increase sensitivity. If either test gives a positive result, this may be regarded as supportive evidence of infection 88, and the children should be offered preventive chemotherapy. Secondly, in children with a low risk of latent infection with M. tuberculosis (e.g. a positive tuberculin skin test during indiscriminate screening without an identified putative source), an IGRA can be used to confirm a positive tuberculin skin test result to increase diagnostic specificity and reduce the risk of a false diagnosis of latent infection with M. tuberculosis. In order to improve clinical management in the future, data on screening results (e.g. tuberculin skin test and IGRA), treatment decision and outcome should be collected in a register (like the TBNET) in order to be able to measure positive and negative predictive value of the various tools and gain further information on the role of IGRA in children in low-prevalence settings. The following recommendations can be summarised for the management of latent infection with M. tuberculosis in children. First, tuberculosis needs to be excluded in any child prior to prescribing preventive therapy. Secondly, children (particularly those aged <5 yrs) with exposure to sputum smear-positive tuberculosis who are tuberculin skin test negative at the time of screening should be offered preventive chemotherapy with isoniazid and should be re-evaluated with a tuberculin skin test and/or IGRA after 3 months. If the test remains negative, the probability of infection is very low and treatment may be stopped. If either test converts to positive, preventive therapy should be continued, unless 3 months of preventive therapy with both isoniazid and rifampicin have already been completed. Children aged ≥5 yrs with exposure to sputum smear-positive tuberculosis should also be screened and a positive tuberculin skin test be confirmed by IGRA, where available. In case in which the treating paediatrician opts not to provide preventive therapy to tuberculin skin test-positive but IGRA-negative children, surveillance for a minimum of 12–24 months is indicated for observation and to collect outcome data, until the positive and negative predictive value of IGRA are better established in the setting of paediatric tuberculosis. Preventive chemotherapy regimens for children are similar to those for adults (section 4). Isoniazid monotherapy is given for ≥6 months. However, treatment for 9 months has been judged to maximise efficacy and effectiveness and is recommended in some countries, such as Germany and the USA 118, 127, 149. The risk of isoniazid-induced hepatitis in children is very small 150. A combination of isoniazid and rifampicin for 3 months has been shown to be a promising alternative. It is effective, increases adherence and has been recommended in the UK 102, 151, 152. Thirdly, children with contact to a source known to have multidrug-resistant tuberculosis should be managed in a specialised centre. In children with a high risk of disease development, preventive chemotherapy (after exclusion of tuberculosis) with two drugs to which the contact strain was susceptible have been recommended 127. Data supporting this approach are scarce and regular follow-up of this cohort is mandatory, accompanied by routine collection of outcome data in such children. Rifampicin can be given for 4–6 months in the case of contact with an isoniazid mono-resistant strain 127. 1) Children are more likely to develop tuberculosis than adults after exposure to an active case, hence contact screening and chemoprophylaxis are particularly important (evidence B). 2) The diagnosis of latent infection with M. tuberculosis in children relies on history of exposure, positivity of the tuberculin skin test and exclusion of clinical symptoms and radiological findings consistent with active tuberculosis (evidence B). 3) The positive and negative predictive value of IGRAs remains to be established in children (evidence D). 4) Children aged <5 yrs in particular should be started on chemoprophylaxis, independent of their tuberculin skin test result (evidence B). 5) Chemoprophylactic or preventive regimes are identical in adults and children, but the dose needs to be adjusted according to weight (evidence B). Despite increasing knowledge on the nature of the host–pathogen interactions in tuberculosis and the development of specific immune responses towards M. tuberculosis, key questions about latency and reactivation of M. tuberculosis infection in humans remain unanswered. It is still not known what proportion of individuals who had once been infected remain persistently infected with M. tuberculosis and how frequently all M. tuberculosis is entirely removed. Detection of an adaptive immune response towards mycobacterial antigens is only an indirect measure that represents a footprint of a contact of the immune system with these organisms. Whether long-term persistence of adaptive immune responses depends on the presence of living mycobacteria is an issue that has not been solved. The introduction of IGRAs to routine clinical practice has improved the identification of close contacts of index cases with infectious tuberculosis, who are possibly infected with viable M. tuberculosis. However, still better diagnostic tests are needed to distinguish persons with tuberculosis from those individuals latently infected with live M. tuberculosis and those who have persistent anti-mycobacterial immune responses without an increased risk of ever progressing to tuberculosis. Whether these situations depend on the number of living mycobacteria and/or the quality of specific immunity that develops in response to M. tuberculosis contact is an issue that cannot be solved based on the currently used diagnostic tools. From an operational point of view, latent infection with M. tuberculosis may best be defined as a state of persistent immune response to prior acquired M. tuberculosis antigens without evidence of clinically manifest tuberculosis. Based on this definition, individuals with latent infection with M. tuberculosis carry an increased risk of progression to tuberculosis. However, an unknown proportion of those with latent infection with M. tuberculosis will not develop tuberculosis because either their immune system persistently controls dormant living mycobacteria or because they are no longer infected with living bacteria. Thus, based on the informative value presently derived by IGRAs and the tuberculin skin test, the term latent infection with M. tuberculosis would at best implicate “lasting tuberculosis immune responses” but not necessarily identify true “latent tuberculosis infection” with viable bacilli and potential risk of developing active tuberculosis. Future guidelines for tuberculosis contact tracing should be based on the predictive values of novel diagnostic tests to direct both the decision to test and the decision to treat. Most experts agree that the currently available IGRAs are superior to the tuberculin skin test in tuberculosis contact tracing. In contrast to the tuberculin skin test, IGRA results are not confounded by BCG vaccination and infection with most species of environmental mycobacteria. Novel test formats that include other antigens, additional markers, the comparative use of various patient specimens and advanced techniques, may soon replace today's commercially available IGRAs for a better diagnosis of true latent infection with M. tuberculosis. Considering the limitations of the currently available assays, the main issue about testing is to restrict it to close contacts of an index case, to children and immunocompromised individuals and to those who are known to be at higher risk of developing tuberculosis and who are willing to accept treatment for latent infection with M. tuberculosis. 1) Latency, as assayed by the tuberculin skin test and IGRA, is a state of persistent mycobacteria-specific T-cell responses in the absence of clinical evidence for tuberculosis disease (evidence A). 2) Whether latent tuberculosis infection depends on the presence of living mycobacteria is presently unclear (evidence A). 3) The tuberculin skin test and IGRAs measure “lasting tuberculosis immune responses” and not “latent tuberculosis infection” (evidence A). 4) The tuberculin skin test and IGRAs cannot discriminate active from latent infection (evidence A). 5) In general, tuberculin skin test and IGRA results correlate poorly, mainly because of positive tuberculin skin test results in individuals vaccinated with BCG (evidence A). 6) Contacts potentially benefiting from preventive therapy should be identified hierarchically according to likelihood of having become infected by a putative source and by presence of potentially aggravating risk factors (evidence A). IGRAs may be superior to the tuberculin skin test in identifying contacts at risk of developing tuberculosis (evidence C). 7) Children are more likely to develop tuberculosis than adults after exposure to an active case, hence contact screening and chemoprophylaxis are particularly important (evidence B). The affiliations are as follows. U. Mack: Lovisenberg Diakonale Sykehus, Oslo, Norway; G.B. Migliori: Fondazione S. Maugeri, Tradate, Italy; M. Sester: Dept of Internal Medicine IV, University of the Saarland, Homburg, Germany; H.L. Rieder: International Union Against Tuberculosis and Lung Disease, Kirchlindach, Switzerland; S. Ehlers, C. Hölscher and C. Lange: Research Center Borstel, Borstel, Germany; D. Goletti: National Institute for Infectious Diseases L. Spallanzani, Rome, Italy; A. Bossink: Diakonessenhuis, Utrecht, the Netherlands; K. Magdorf and A. Detjen: Dept of Paediatric Pneumology and Immunology, Charité, Berlin, Germany; B. Kampmann: Imperial College London, London, UK; S.M. Arend: Leiden University Medical Centre, Leiden, the Netherlands; G. Bothamley: Homerton University Hospital, London, UK; J.P. Zellweger: Swiss Lung Association, Berne, Switzerland; H. Milburn: Guy's and St Thomas Hospital, London, UK; R. Diel: University Düsseldorf, Düsseldorf, Germany; P. Ravn: University Hospital Herlev, Denmark; F. Cobelens: Royal Netherlands Tuberculosis Association (KNCV), the Hague, the Netherlands; P.J. Cardona: Institut Germans Trias i Pujol, UAB, Badalona, and CIBER Enfermedades Respiratorias, and Instituto Carlos III, Palma de Mallorca, Spain; B. Kan: Karolinska Hospital, Stockholm, Sweden; I. Solovic: Institute for TB Lung Disease and Thoracic Surgery, Vysne Hagy, Slovakia; R. Duarte: Centro de Diagnóstico Pneumológico, Vila Nova de Gaia, Portugal; and D.M. Cirillo: San Raffaele Scientific Institute, Milan, Italy. Author contributions are as follows (#: section leader). Planning and writing of the manuscript, Introduction, and Conclusions: C. Lange, U. Mack, G.B. Migliori, H.L. Rieder and M. Sester; Section 1: S. Ehlers#, C. Hölscher and P.J. Cardona; Section 2: D. Goletti#, D.M. Cirillo, C. Lange and M. Sester; Section 3: A. Bossink#, S.M. Arend, R. Diel and P. Ravn; Section 4: H.L. Rieder#, G. Bothamley, F. Cobelens, R. Duarte, B. Kan, G.B. Migliori, H. Milburn, I. Solovic and J.P. Zellweger; Section 5: K. Magdorf#, A.K. Detjen and B. Kampmann. Andvord KF. Hvad kan vi lære ved å følge tuberkulosens gang fra generasjon til generasjon? [What can we learn by following the development of tuberculosis from one generation to another?]. Norsk Magazin for Lægevidenskapen 1930;91:642–660. Andvord KF, Wijsmuller G, Blomberg B. What can we learn by following the development of tuberculosis from one generation to another? 1930. Int J Tuberc Lung Dis 2002;6:562–568. Rieder HL. Reconciling historical epidemiological, bacteriological and immunological observations in tuberculosis. Int J Epidemiol 2008;37:932–934. Arend SM, van Dissel JT. Evidence of endogenous reactivation of tuberculosis after a long period of latency. J Infect Dis 2002;186:876–877. Tufariello JM, Chan J, Flynn JL. Latent tuberculosis: mechanisms of host and bacillus that contribute to persistent infection. Lancet Infect Dis 2003;3:578–590. Kaufmann SH, Cole ST, Mizrahi V, Rubin E, Nathan C. Mycobacterium tuberculosis and the host response. J Exp Med 2005;201:1693–1697. Chapman AL, Munkanta M, Wilkinson KA, et al. Rapid detection of active and latent tuberculosis infection in HIV-positive individuals by enumeration of Mycobacterium tuberculosis-specific T cells. AIDS 2002;16:2285–2293. Sester M, Sester U, Clauer P, et al. Tuberculin skin testing underestimates a high prevalence of latent tuberculosis infection in hemodialysis patients. Kidney Int 2004;65:1826–1834. Sester U, Junker H, Hodapp T, et al. Improved efficiency in detecting cellular immunity towards M. tuberculosis in patients receiving immunosuppressive drug therapy. Nephrol Dial Transplant 2006;21:3258–3268. Passalent L, Khan K, Richardson R, Wang J, Dedier H, Gardam M. Detecting latent tuberculosis infection in hemodialysis patients: a head-to-head comparison of the T-SPOT.TB test, tuberculin skin test, and an expert physician panel. Clin J Am Soc Nephrol 2007;2:68–73. Richeldi L, Ewer K, Losi M, et al. Early diagnosis of subclinical multidrug-resistant tuberculosis. Ann Intern Med 2004;140:709–713. Pai M, Menzies D. Interferon-γ release assays: what is their role in the diagnosis of active tuberculosis?. Clin Infect Dis 2007;44:74–77. Pai M, Riley LW, Colford JM Jr. Interferon-γ assays in the immunodiagnosis of tuberculosis: a systematic review. Lancet Infect Dis 2004;4:761–776. Chan J, Flynn J. The immunological aspects of latency in tuberculosis. Clin Immunol 2004;110:2–12. Khader SA, Cooper AM. IL-23 and IL-17 in tuberculosis. Cytokine 2008;41:79–83. Kursar M, Koch M, Mittrucker HW, et al. Cutting Edge: Regulatory T cells prevent efficient clearance of Mycobacterium tuberculosis. J Immunol 2007;178:2661–2665. Hernandez-Pando R, Jeyanathan M, Mengistu G, et al. Persistence of DNA from Mycobacterium tuberculosis in superficially normal lung tissue during latent infection. Lancet 2000;356:2133–2138. Rook GA, Zumla A. Advances in the immunopathogenesis of pulmonary tuberculosis. Curr Opin Pulm Med 2001;7:116–123. Gomez JE, McKinney JD. M. tuberculosis persistence, latency, and drug tolerance. Tuberculosis (Edinb) 2004;84:29–44. Manabe YC, Bishai WR. Latent Mycobacterium tuberculosis – persistence, patience, and winning by waiting. Nat Med 2000;6:1327–1329. Cardona PJ. New insights on the nature of latent tuberculosis infection and its treatment. Inflamm Allergy Drug Targets 2007;6:27–39. Leyten EM, Lin MY, Franken KL, et al. Human T-cell responses to 25 novel antigens encoded by genes of the dormancy regulon of Mycobacterium tuberculosis. Microbes Infect 2006;8:2052–2060. Chee CB, KhinMar KW, Gan SH, Barkham TM, Pushparani M, Wang YT. Latent tuberculosis infection treatment and T-cell responses to Mycobacterium tuberculosis-specific antigens. Am J Respir Crit Care Med 2007;175:282–287. Wilkinson KA, Kon OM, Newton SM, et al. Effect of treatment of latent tuberculosis infection on the T cell response to Mycobacterium tuberculosis antigens. J Infect Dis 2006;193:354–359. Hart PD, Sutherland I. BCG and vole bacillus vaccines in the prevention of tuberculosis in adolescence and early adult life. Br Med J 1977;2:293–295. Efficacy of various durations of isoniazid preventive therapy for tuberculosis: five years of follow-up in the IUAT trial. International Union Against Tuberculosis Committee on Prophylaxis. Bull World Health Organ 1982;60:555–564. Vynnycky E, Fine PE. Lifetime risks, incubation period, and serial interval of tuberculosis. Am J Epidemiol 2000;152:247–263. Goletti D, Butera O, Bizzoni F, Casetti R, Girardi E, Poccia F. Region of difference 1 antigen-specific CD4+memory T cells correlate with a favorable outcome of tuberculosis. J Infect Dis 2006;194:984–992. Pai M, Kalantri S, Dheda K. New tools and emerging technologies for the diagnosis of tuberculosis: part I. Latent tuberculosis. Expert Rev Mol Diagn 2006;6:413–422. Lalvani A. Diagnosing tuberculosis infection in the 21st century: new tools to tackle an old enemy. Chest 2007;131:1898–1906. Mori T, Sakatani M, Yamagishi F, et al. Specific detection of tuberculosis infection: an interferon-γ-based assay using new antigens. Am J Respir Crit Care Med 2004;170:59–64. Huebner RE, Schein MF, Bass JB Jr. The tuberculin skin test. Clin Infect Dis 1993;17:968–975. Turk JL. Delayed hypersensitivity and its significance in medicine. Triangle 1966;7:275–280. Turk JL. Cellular dynamics in lymph nodes and skin reactions. Bibl Haematol 1968;29:645–646. Platt JL, Grant BW, Eddy AA, Michael AF. Immune cell populations in cutaneous delayed-type hypersensitivity. J Exp Med 1983;158:1227–1242. Duke O, Panayi GS, Janossy G, Poulter LW. An immunohistological analysis of lymphocyte subpopulations and their microenvironment in the synovial membranes of patients with rheumatoid arthritis using monoclonal antibodies. Clin Exp Immunol 1982;49:22–30. Kenney RT, Rangdaeng S, Scollard DM. Skin blister immunocytology. A new method to quantify cellular kinetics in vivo. J Immunol Methods 1987;97:101–110. Poulter LW, Seymour GJ, Duke O, Janossy G, Panayi G. Immunohistological analysis of delayed-type hypersensitivity in man. Cell Immunol 1982;74:358–369. Gibbs JH, Ferguson J, Brown RA, et al. Histometric study of the localisation of lymphocyte subsets and accessory cells in human Mantoux reactions. J Clin Pathol 1984;37:1227–1234. Picker LJ, Treer JR, Ferguson-Darnell B, Collins PA, Bergstresser PR, Terstappen LW. Control of lymphocyte recirculation in man. II. Differential regulation of the cutaneous lymphocyte-associated antigen, a tissue-selective homing receptor for skin-homing T cells. J Immunol 1993;150:1122–1136. Pai M, Menzies D. The new IGRA and the old TST: making good use of disagreement. Am J Respir Crit Care Med 2007;175:529–531. Lalvani A, Pathan AA, Durkan H, et al. Enhanced contact tracing and spatial tracking of Mycobacterium tuberculosis infection by enumeration of antigen-specific T cells. Lancet 2001;357:2017–2021. Mahairas GG, Sabo PJ, Hickey MJ, Singh DC, Stover CK. Molecular analysis of genetic differences between Mycobacterium bovis BCG and virulent M. bovis. J Bacteriol 1996;178:1274–1282. Vincenti D, Carrara S, Butera O, et al. Response to region of difference 1 (RD1) epitopes in human immunodeficiency virus (HIV)-infected individuals enrolled with suspected active tuberculosis: a pilot study. Clin Exp Immunol 2007;150:91–98. Millington KA, Innes JA, Hackforth S, et al. Dynamic relationship between IFN-γ and IL-2 profile of Mycobacterium tuberculosis-specific T cells and antigen load. J Immunol 2007;178:5217–5226. Vincenti D, Carrara S, De Mori P, et al. Identification of early secretory antigen target-6 epitopes for the immunodiagnosis of active tuberculosis. Mol Med 2003;9:105–111. Geluk A, Lin MY, van Meijgaarden KE, et al. T-cell recognition of the HspX protein of Mycobacterium tuberculosis correlates with latent M. tuberculosis infection but not with M. bovis BCG vaccination. Infect Immun 2007;75:2914–2921. Lin MY, Geluk A, Smith SG, et al. Lack of immune responses to Mycobacterium tuberculosis DosR regulon proteins following Mycobacterium bovis BCG vaccination. Infect Immun 2007;75:3523–3530. Demissie A, Leyten EM, Abebe M, et al. Recognition of stage-specific mycobacterial antigens differentiates between acute and latent infections with Mycobacterium tuberculosis. Clin Vaccine Immunol 2006;13:179–186. Seder RA, Darrah PA, Roederer M. T-cell quality in memory and protection: implications for vaccine design. Nat Rev 2008;8:247–258. Dosanjh DP, Hinks TS, Innes JA, et al. Improved diagnostic evaluation of suspected tuberculosis. Ann Intern Med 2008;148:325–336. Jafari C, Ernst M, Kalsdorf B, et al. Rapid diagnosis of smear-negative tuberculosis by bronchoalveolar lavage enzyme-linked immunospot. Am J Respir Crit Care Med 2006;174:1048–1054. Losi M, Bossink A, Codecasa L, et al. Use of a T-cell interferon-γ release assay for the diagnosis of tuberculous pleurisy. Eur Respir J 2007;30:1173–1179. Jafari C, Ernst M, Strassburg A, et al. Local immunodiagnosis of pulmonary tuberculosis by enzyme-linked immunospot. Eur Respir J 2008;31:261–265. Barry SM, Lipman MC, Bannister B, Johnson MA, Janossy G. Purified protein derivative-activated type 1 cytokine-producing CD4+T lymphocytes in the lung: a characteristic feature of active pulmonary and nonpulmonary tuberculosis. J Infect Dis 2003;187:243–250. Wilkinson KA, Wilkinson RJ, Pathan A, et al. Ex vivo characterization of early secretory antigenic target 6-specific T cells at sites of active disease in pleural tuberculosis. Clin Infect Dis 2005;40:184–187. Thomas MM, Hinks TS, Raghuraman S, et al. Rapid diagnosis of Mycobacterium tuberculosis meningitis by enumeration of cerebrospinal fluid antigen-specific T-cells. Int J Tuberc Lung Dis 2008;12:651–657. Blower SM, McLean AR, Porco TC, et al. The intrinsic transmission dynamics of tuberculosis epidemics. Nat Med 1995;1:815–821. Bothamley GH, Ditiu L, Migliori GB, Lange C. TBNET contributors. Active case-finding of tuberculosis in Europe. A TBNET (Tuberculosis Network European Trials Group) survey. Eur Respir J 2008;32:1023–1030. Carmona L, Gomez-Reino JJ, Rodriguez-Valverde V, et al. Effectiveness of recommendations to prevent reactivation of latent tuberculosis infection in patients treated with tumor necrosis factor antagonists. Arthritis Rheum 2005;52:1766–1772. Huizinga TW, Arend SM. Is the tuberculin skin test an accurate method of detecting tuberculosis in patients with rheumatoid arthritis?. Nat Clin Pract Rheumatol 2006;2:188–189. Dinser R, Fousse M, Sester U, et al. Evaluation of latent tuberculosis infection in patients with inflammatory arthropathies before treatment with TNF-α blocking drugs using a novel flow-cytometric interferon-γ release assay. Rheumatology (Oxford) 2008;47:212–218. Winthrop KL, Nyendak M, Calvet H, et al. Interferon-γ release assays for diagnosing Mycobacterium tuberculosis infection in renal dialysis patients. Clin J Am Soc Nephrol. 2008;3:1357–1363. Johnson JL, Nyole S, Okwera A, et al. Instability of tuberculin and Candida skin test reactivity in HIV-infected Ugandans. The Uganda-Case Western Reserve University Research Collaboration. Am J Respir Crit Care Med 1998;158:1790–1796. Luetkemeyer AF, Charlebois ED, Flores LL, et al. Comparison of an interferon-γ release assay with tuberculin skin testing in HIV-infected individuals. Am J Respir Crit Care Med 2007;175:737–742. Cobelens FG, Egwaga SM, van Ginkel T, Muwinge H, Matee MI, Borgdorff MW. Tuberculin skin testing in patients with HIV infection: limited benefit of reduced cutoff values. Clin Infect Dis 2006;43:634–639. Graham NM, Nelson KE, Solomon L, et al. Prevalence of tuberculin positivity and skin test anergy in HIV-1-seropositive and -seronegative intravenous drug users. JAMA 1992;267:369–373. Markowitz N, Hansen NI, Wilcosky TC, et al. Tuberculin and anergy testing in HIV-seropositive and HIV-seronegative persons. Pulmonary Complications of HIV Infection Study Group. Ann Intern Med 1993;119:185–193. Sester U, Gärtner BC, Wilkens H, et al. Differences in CMV-specific T-cell levels and long-term susceptibility to CMV infection after kidney, heart and lung transplantation. Am J Transplant 2005;5:1483–1489. Halloran PF. Immunosuppressive drugs for kidney transplantation. N Engl J Med 2004;351:2715–2729. Girndt M, Sester M, Sester U, Kaul H, Köhler H. Molecular aspects of T- and B-cell function in uremia. Kidney Int Suppl 2001;78:S206–S211. Mazurek GH, Jereb J, Lobue P, Iademarco MF, Metchock B, Vernon A. Guidelines for using the QuantiFERON-TB Gold test for detecting Mycobacterium tuberculosis infection, United States. MMWR Recomm Rep 2005;54:49–55. Diel R, Loddenkemper R, Meywald-Walter K, Niemann S, Nienhaus A. Predictive value of a whole-blood IFN-γ assay for the development of active TB disease. Am J Respir Crit Care Med 2008;177:1164–1170. Diel R, Ernst M, Doscher G, et al. Avoiding the effect of BCG vaccination in detecting Mycobacterium tuberculosis infection with a blood test. Eur Respir J 2006;28:16–23. Brock I, Weldingh K, Lillebaek T, Follmann F, Andersen P. Comparison of tuberculin skin test and new specific blood test in tuberculosis contacts. Am J Respir Crit Care Med 2004;170:65–69. Shams H, Weis SE, Klucar P, et al. Enzyme-linked immunospot and tuberculin skin testing to detect latent tuberculosis infection. Am J Respir Crit Care Med 2005;172:1161–1168. Ewer K, Deeks J, Alvarez L, et al. Comparison of T-cell-based assay with tuberculin skin test for diagnosis of Mycobacterium tuberculosis infection in a school tuberculosis outbreak. Lancet 2003;361:1168–1173. Vassilopoulos D, Stamoulis N, Hadziyannis E, Archimandritis AJ. Usefulness of enzyme-linked immunospot assay (ELISPOT) compared to tuberculin skin testing for latent tuberculosis screening in rheumatic patients scheduled for anti-tumor necrosis factor treatment. J Rheumatol 2008;35:1271–1276. Matulis G, Juni P, Villiger PM, Gadola SD. Detection of latent tuberculosis in immunosuppressed patients with autoimmune diseases: performance of a Mycobacterium tuberculosis antigen-specific interferon-γ assay. Ann Rheum Dis 2008;67:84–90. Sellam J, Hamdi H, Roy C, Baron G, et al. Comparison of in vitro-specific blood tests with tuberculin skin test for diagnosis of latent tuberculosis before anti-TNF therapy. Ann Rheum Dis 2007;66:1610–1615. Porsa E, Cheng L, Graviss EA. Comparison of an ESAT-6/CFP-10 peptide-based enzyme-linked immunospot assay to a tuberculin skin test for screening of a population at moderate risk of contracting tuberculosis. Clin Vaccine Immunol 2007;14:714–719. Kang YA, Lee HW, Yoon HI, et al. Discrepancy between the tuberculin skin test and the whole-blood interferon-γ assay for the diagnosis of latent tuberculosis infection in an intermediate tuberculosis-burden country. JAMA 2005;293:2756–2761. Dominguez J, Ruiz-Manzano J, De Souza-Galvao M, et al. Comparison of two commercially available γ-interferon blood tests for immunodiagnosis of tuberculosis. Clin Vaccine Immunol 2008;15:168–171. Franken WP, Koster BF, Bossink AW, et al. Follow-up study of tuberculosis-exposed supermarket customers with negative tuberculin skin test results in association with positive γ-interferon release assay results. Clin Vaccine Immunol 2007;14:1239–1241. Guidelines for the investigation of contacts of persons with infectious tuberculosis. Recommendations from the National Tuberculosis Controllers Association and CDC. MMWR Recomm Rep 2005;54:1–47. Lillebaek T, Dirksen A, Baess I, Strunge B, Thomsen VO, Andersen AB. Molecular evidence of endogenous reactivation of Mycobacterium tuberculosis after 33 years of latent infection. J Infect Dis 2002;185:401–404. Selwyn PA, Hartel D, Lewis VA, et al. A prospective study of the risk of tuberculosis among intravenous drug users with human immunodeficiency virus infection. N Engl J Med 1989;320:545–550. Guelar A, Gatell JM, Verdejo J, et al. A prospective study of the risk of tuberculosis among HIV-infected patients. AIDS 1993;7:1345–1349. Antonucci G, Girardi E, Raviglione MC, Ippolito G. Risk factors for tuberculosis in HIV-infected persons. A prospective cohort study. The Gruppo Italiano di Studio Tubercolosi e AIDS (GISTA). JAMA 1995;274:143–148. Rust P, Thomas J. A method for estimating the prevalence of tuberculosis infection. Am J Epidemiol 1975;101:311–322. Veen J. Microepidemics of tuberculosis: the stone-in-the-pond principle. Tuber Lung Dis 1992;73:73–76. Lutong L, Bei Z. Association of prevalence of tuberculin reactions with closeness of contact among household contacts of new smear-positive pulmonary tuberculosis patients. Int J Tuberc Lung Dis 2000;4:275–277. Houk VN, Baker JH, Sorensen K, Kent DC. The epidemiology of tuberculosis infection in a closed environment. Arch Environ Health 1968;16:26–35. Grzybowski S, Barnett GD, Styblo K. Contacts of cases of active pulmonary tuberculosis. Bull Int Union Tuberc 1975;50:90–106. Liippo KK, Kulmala K, Tala EO. Focusing tuberculosis contact tracing by smear grading of index cases. Am Rev Respir Dis 1993;148:235–236. Riley RL, Mills CC, Nyka W, Weinstock N, Storey PB, Sultan LU. Aerial dissemination of pulmonary tuberculosis. A two-year study of contagion in a tuberculosis ward. Am J Hyg 1959;70:185–196. Reichler MR, Reves R, Bur S, et al. Evaluation of investigations conducted to detect and prevent transmission of tuberculosis. JAMA 2002;287:991–995. Control and prevention of tuberculosis in the United Kingdom: code of practice 2000. Joint Tuberculosis Committee of the British Thoracic Society. Thorax 2000;55:887–901. Diel R, Forssbohm M, Loytved G, et al. Empfehlungen für die Umgebungsuntersuchungen bei Tuberkulose [Recommendations for background studies in tuberculosis]. Pneumologie 2007;61:440–455. The National Collaborating Centre for Chronic Conditions. Tuberculosis. Clinical Diagnosis and Management of Tuberculosis, and Measures for its Prevention and Control. London, Royal College of Physicians, 2006. Diel R, Nienhaus A, Schaberg T. Cost-effectiveness of isoniazid chemoprevention in close contacts. Eur Respir J 2005;26:465–473. Jereb J, Etkind SC, Joglar OT, Moore M, Taylor Z. Tuberculosis contact investigations: outcomes in selected areas of the United States, 1999. Int J Tuberc Lung Dis 2003;7: Suppl. 3 S384–S390. Rennie TW, Bothamley GH, Engova D, Bates IP. Patient choice promotes adherence in preventive treatment for latent tuberculosis. Eur Respir J 2007;30:728–735. Ferebee SH. Controlled chemoprophylaxis trials in tuberculosis. A general review. Adv Tuberc Res 1969;17:28–106. Hong Kong Chest Service/Tuberculosis Research Centre, Madras Medical Research Council, British Medical Research Council. A double-blind placebo-controlled clinical trial of three antituberculosis chemoprophylaxis regimens in patients with silicosis in Hong Kong. Am Rev Respir Dis 1992;145:36–41. Targeted tuberculin testing and treatment of latent tuberculosis infection. Am J Respir Crit Care Med 2000;161:S221–S247. Snider DE Jr, Caras GJ, Koplan JP. Preventive therapy with isoniazid. Cost-effectiveness of different durations of therapy. JAMA 1986;255:1579–1583. Lyons RW. Orange contact lenses from rifampin. N Engl J Med 1979;300:372–373. Steele MA, Burk RF, DesPrez RM. Toxic hepatitis with isoniazid and rifampin. A meta-analysis. Chest 1991;99:465–471. Chang KC, Leung CC, Yew WW, Tam CM. Standard anti-tuberculosis treatment and hepatotoxicity: do dosing schedules matter?. Eur Respir J 2007;29:347–351. Comstock GW, Edwards PQ. The competing risks of tuberculosis and hepatitis for adult tuberculin reactors. Am Rev Respir Dis 1975;111:573–577. Marais BJ, Gie RP, Schaaf HS, et al. The natural history of childhood intra-thoracic tuberculosis: a critical review of literature from the pre-chemotherapy era. Int J Tuberc Lung Dis 2004;8:392–402. Colditz GA, Berkey CS, Mosteller F, et al. The efficacy of bacillus Calmette-Guerin vaccination of newborns and infants in the prevention of tuberculosis: meta-analyses of the published literature. Pediatrics 1995;96:29–35. Soysal A, Millington KA, Bakir M, et al. Effect of BCG vaccination on risk of Mycobacterium tuberculosis infection in children with household tuberculosis contact: a prospective community-based study. Lancet 2005;366:1443–1451. Infuso A, Falzon D. European survey of BCG vaccination policies and surveillance in children, 2005. Euro Surveill 2006;11:6–11. Farhat M, Greenaway C, Pai M, Menzies D. False-positive tuberculin skin tests: what is the absolute effect of BCG and non-tuberculous mycobacteria?. Int J Tuberc Lung Dis 2006;10:1192–1204. Romanus V. Mycobacterial infections in Sweden. Scand J Infect Dis Suppl 1995;98:15–16. Haverkamp MH, Arend SM, Lindeboom JA, Hartwig NG, van Dissel JT. Nontuberculous mycobacterial infection in children: a 2-year prospective surveillance study in the Netherlands. Clin Infect Dis 2004;39:450–456. Detjen AK, Keil T, Roll S, et al. Interferon-γ release assays improve the diagnosis of tuberculosis and nontuberculous mycobacterial disease in children in a country with a low incidence of tuberculosis. Clin Infect Dis 2007;45:322–328. Liebeschuetz S, Bamber S, Ewer K, Deeks J, Pathan AA, Lalvani A. Diagnosis of tuberculosis in South African children with a T-cell-based assay: a prospective cohort study. Lancet 2004;364:2196–2203. Diel R, Forssbohm M, Loytved G, et al. Recommendations for environmental contact tracing in tuberculosis. German Central Committee Against Tuberculosis. Gesundheitwesen 2007;69:488–503. Ozuah PO, Ozuah TP, Stein RE, Burton W, Mulvihill M. Evaluation of a risk assessment questionnaire used to target tuberculin skin testing in children. JAMA 2001;285:451–453. Comstock GW. How much isoniazid is needed for prevention of tuberculosis among immunocompetent adults?. Int J Tuberc Lung Dis 1999;3:847–850. O'Brien RJ, Long MW, Cross FS, Lyle MA, Snider DE Jr. Hepatotoxicity from isoniazid and rifampin among children treated for tuberculosis. Pediatrics 1983;72:491–499. Spyridis NP, Spyridis PG, Gelesme A, et al. The effectiveness of a 9-month regimen of isoniazid alone versus 3- and 4-month regimens of isoniazid plus rifampin for treatment of latent tuberculosis infection in children: results of an 11-year randomized study. Clin Infect Dis 2007;45:715–722. Ormerod LP. Rifampicin and isoniazid prophylactic chemotherapy for tuberculosis. Arch Dis Child 1998;78:169–171.